Here we’ll check all offers from car service centers and compare their oil change prices. You can learn about oil change intervals for different car types, find average oil change cost by motor oil type and answers to most common questions. An oil change should be done on every vehicle regardless if it’s a new car or not. They’re usually not too expensive and most of the time they will vary in cost from between $16 to $60. Price of motor oil change will differ between shops but most of the time these automotive stores run specials on oil changes so it may be possible to get one done for less than $15. A lot of automotive companies run oil change specials because it’s a way to get potential customers into their shop so they can recommend that they get something else fixed on their car. Most cars will need an oil change every year or every 7,500 miles whichever occurs first. This is for the average driver but most people aren’t the average driver so once every 6 months may be a good time to check to see if your car needs its oil changed. The driver plays a very important role when determining when a car needs an oil change. Not all drivers drive the same amount of distance and some people drive a long way to work every day. Other people may work down the street from where they live. Older cars will generally need to have an oil change more often than newer cars because older cars have been through more wear and tear. It is recommended that an older car have an oil change once in every 6 months. A newer car can operate fine with getting an oil change once every year. If a driver forgets to change his oil, he is most likely putting his or her car at risk. Multiple things can happen like the oil will get very dirty and this will have an effect on how the motor sounds when it’s running. If things get worse, the engine can actually blow which will cause the driver to buy another car. This is because in most cases it’s just cheaper to buy another car than buying another engine and paying someone for the labor cost of taking it out and putting it in. There are many ways to get the best oil change price. One way is for the owner of the car to do it themselves. A lot of people would rather just take their car to an automotive shop and just pay them to do it but it wouldn’t be too difficult for the owner to do it themselves. If the driver chooses to change the oil, it can contribute to other potential things like they may want to learn how to do other repairs on the car instead of taking it to the traditional auto center and pay full price for oil change. Before you attempt to change the oil, you should go online to the website like this because we have step by step DIY oil change guide and find out everything they need to know because if it’s done incorrectly, terrible damage may be done to the car. Experienced friends are also a good source of help when attempting to change the oil. It may be smart for the owner to have their friend walk them through the first time so they can learn before they actually attempt it. There are numerous places to get a cheap oil change. Most family-owned automotive centers charge a lot less than the known franchises because they know they cannot compete with a well known and trusted brand if they have the same oil change price. There are countless oil change coupons available that are easy to get. Most of the time if the owner of a car gets their car worked on at a station, they will ask for your address because they will mail you out coupons whenever they are running a deal. This is a great way to stay informed about the average price for a motor oil change in your area. If auto centers do not have certain drivers in their database, then they can also print coupons online or even go to an auto center and ask them if they have any extra coupons. Most of the time though, it’s best to go to the actual auto center and ask if they have any coupons because even if they don’t, they will be more than willing to negotiate the price. As we touched on earlier, the best price for an oil change isn’t necessarily the one that appears to be the lowest. I know that our local Meineke center offers a $19.95 oil change but they don’t mention the oil disposal fee and other charges that actually take the “standard” price up to about $26 before tax. Plus as we already spoke about what is your time worth? If you can get a $30 oil change at a quick service place where you don’t have to make an appointment or even leave your car and can be done in less than 30 minutes (which in my experience is pretty standard), is that worth paying a few dollars more than going to a traditional oil change center on an appointment and waiting over an hour by the time your vehicle has been finished? Firestone oil change prices when you have the coupon. If you have a more expensive vehicle, you can expect to pay more if you go to your dealer or specialized service center too. I saw an ad just today for a local center that specializes in BMWs and they were advertising oil changes for $80-$100 depending on the engine size. Mind you the more expensive cost gets offset by the fact that they recommend oil changes at 7500-mile intervals too which is a larger interval than some smaller and less expensive vehicles. We collect all coupons for the oil change so you can save some bucks. And if you drive a diesel, you can expect to pay more for your oil changes especially if you happen to drive a truck or larger vehicle with a larger engine that holds more oil than your regular passenger vehicle. For larger vehicles, you might find yourself paying upwards of $100 per oil change. In each case, you can, of course, reduce the price for your oil change by doing the work yourself if you’re so inclined, saving yourself not only the cost of labor but whatever markup your service center would normally add to the oil and filter too! Q: How much is a synthetic oil change at Jiffy Lube? Q: How much does Pep Boys charge for an oil change? A: Conventional oil changes are $19.99 and full synthetic oil change are $49.99 with coupon. Q: How often do you need an oil change with synthetic oil? A: Every 7,500 or 10,000 miles for newer models of vehicles. Q: How much is an oil change with synthetic oil? A: It depends on the motor oil brand, but the price range is between $20 and $50. Q: How long does a synthetic oil change last? A: Depends on the vehicle and driving conditions you should change your synthetic oil every 5,000 to 15,000 miles, or in one year. Q: What are the advantages of using synthetic motor oil? A: You can read a complete comparison of standard and synthetic motor oil here. Q: How much is a Walmart oil change? A: From the $19.88 for conventional motor oil (5W-20, 5W-30 or 10W-30) up to $49.88 for full synthetic motor oil. 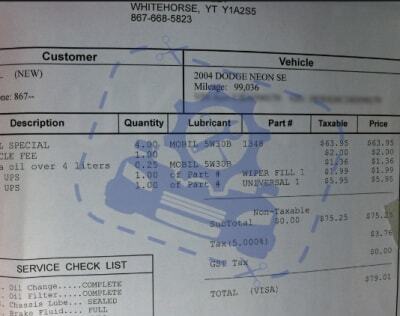 Q: How much does it cost to do an oil change at home? A: Depending on the car model and year of make you can save about $15, but that can varies. 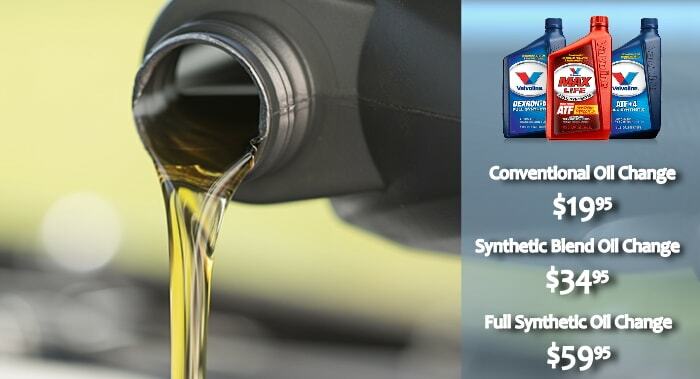 Q: How much is a full synthetic oil change at Valvoline? Q: How much does Midas charge for an oil change? Q: How much does Firestone charge for an oil change? A: Firestone standard (conventional) oil change and Synthetic blend cost $19.99, the High mileage you can get at $34.99 and Full synthetic motor oil change is $49.99. Note that all prices are with coupons. Q: How many miles is full synthetic oil good for? A: For newer cars, most auto repair centers recommend changing oil every 7,500 or 10,000 miles. Q: How much is an oil change at Goodyear?